Where to find Three Hills hotels near an airport? Where can I find hotels in Three Hills that are near tourist attractions? 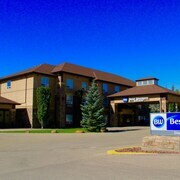 Are you arranging to spend some nights in Drumheller? Hoping to reserve a hotel in or around Three Hills? The middle of Three Hills has 4 accommodations within 0.1 kilometres (0.06 miles). 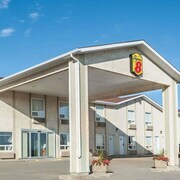 Experienced vacationers who fully appreciate the importance of finding accommodation close to the action should check out the Best Western Diamond Inn and Rest Easy Motel, all of which are located within 1 kilometre (0.6 miles) of Three Hills' downtown area. A couple of Expedia-listed places to stay that could be ideal are the Super 8 Three Hills Alberta and the Lamplighter Inn. 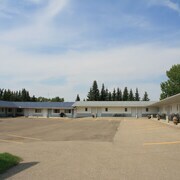 The Super 8 Three Hills Alberta is located 2 kilometres (1 mile) from the middle of Three Hills. 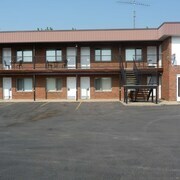 The Lamplighter Inn is situated 1 kilometre (1 mile) away. The River Road Inn is 14 kilometres (9 miles) from the center of Three Hills and is another recommended option. After you have spent time in Three Hills, ensure you have enough time to explore Southern Alberta's other scenic and cultural delights. Southern Alberta has rivers, streams and lakes, and commonly visited Southern Alberta tourist sights include old towns, art museums and nature museums. Popular activities in this part of Canada include snowboarding. Just because you're traveling, doesn't mean you can't indulge in your love of all things sport. Scotiabank Saddledome is 90 kilometres (57 miles) to the southwest of Three Hills. Stay nearby to the action at the Hotel Le Germain Calgary or the Kensington Riverside Inn. For travelers arriving or departing via Calgary International Airport, you might like to book a bed at Delta Hotels by Marriott Calgary Airport In-Terminal, or Best Western Premier Freeport Inn & Suites, both of which are conveniently located nearby. Are there hotels in other cities near Three Hills? What other types of accommodations are available in Three Hills? Explore Three Hills with Expedia.ca’s Travel Guides to find the best flights, cars, holiday packages and more!